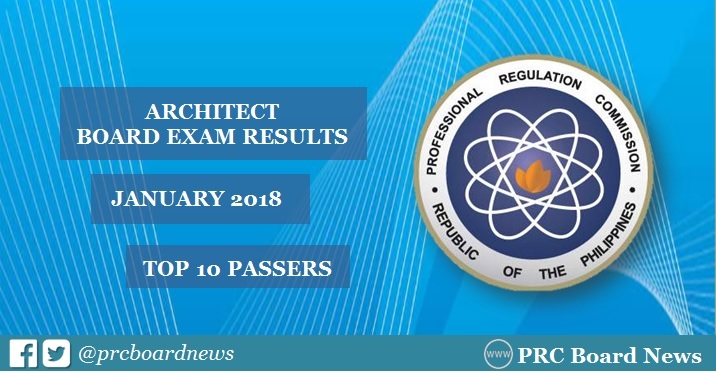 MANILA, Philippines - The January 2018 Architect board exam or Architect Licensure Examination (ALE) top 10 or topnotchers including other results - list of passers, top performing schools and performance of schools are released online expected on Thursday, February 1 or in four (4) working days after the exam. Marc Henrich Wee Eng Go from University of Santo Tomas aced the board with 85.40%. It was followed by Marc Terence Limsico Co and Rafael Cruz, both from University of the Philippines (UP) - Diliman, 84.20%. The Professional Regulation Commission (PRC) administered the licensure exam in the cities of Manila, Baguio, Cebu, Davao and Legaspi on January 26 and 28, 2018. In the January 2017 exams, Luiz Marko Pantua Silang from University of the Philippines (UP) - Diliman got the highest place with 83.70%. Robin Royce Yu Ibanez, also from UPD, ranked second with 83.20%. In the January 2016 exam, Neil John Jalandra Bersabe, graduate of Ateneo de Davao University, topped ALE with 84.50%. Lea Angela Lozano Celestial and Zenia Eloisa Gelbolingo Libron, both from UPD, placed second with 82.40%. Here's overview of topnotchers for Architecture board exam in the past years.